With so many options of countertop materials on the market, we know how time consuming it can be to choose the right one. We have narrowed it down to the 5 most popular choices that we see on a daily basis: granite, wood, quartz, laminate, and marble. 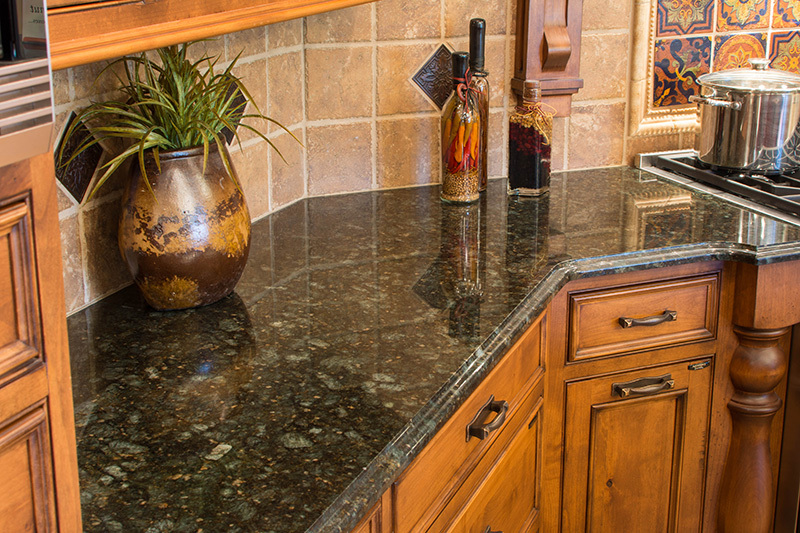 Granite is one of the most commonly used countertop materials on the market. The uniqueness of a natural stone will give your home that luxurious look. No two slabs are truly the same which can serve as a positive by adding interest or present a challenge for those desiring uniformity. 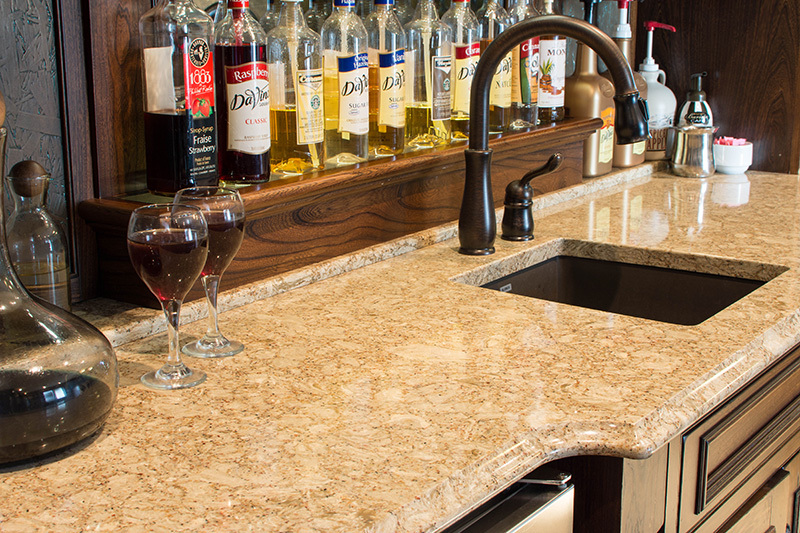 Granite is a very durable surface that will stand the test of time with proper maintenance, including routine sealing. For a more organic look, wood is an easy choice due to the natural muted appearance from the wood itself. Wood can be what your kitchen needs to give it a natural warm look. The different stain colors and wood species make it an excellent choice when wanting to darken or lighten the color temperature of a room and to match or offset your other furniture and cabinet colors. 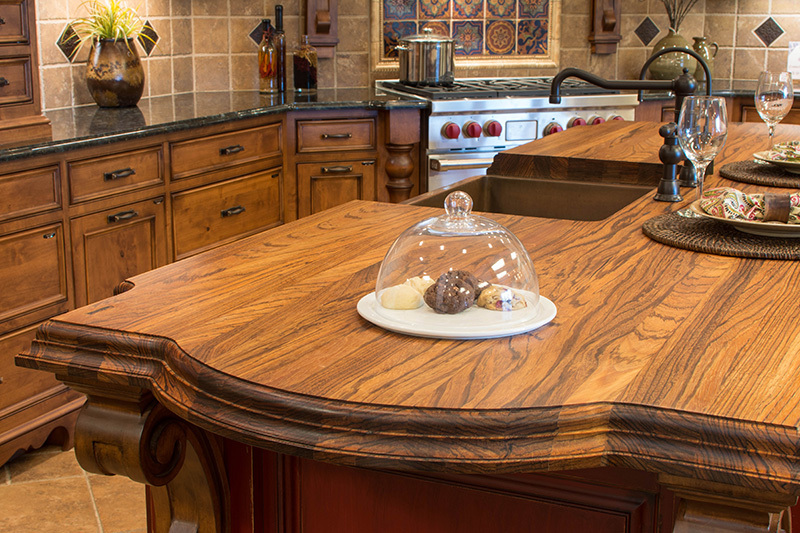 For example, here’s a photo of how we added a wood top to an island with the rest of the tops showcasing granite. Cons: Must be properly sealed to prevent water damage, Softer than stone and more susceptible to getting scratches and dents. What is quartz? This is one of the most asked questions in our design center. 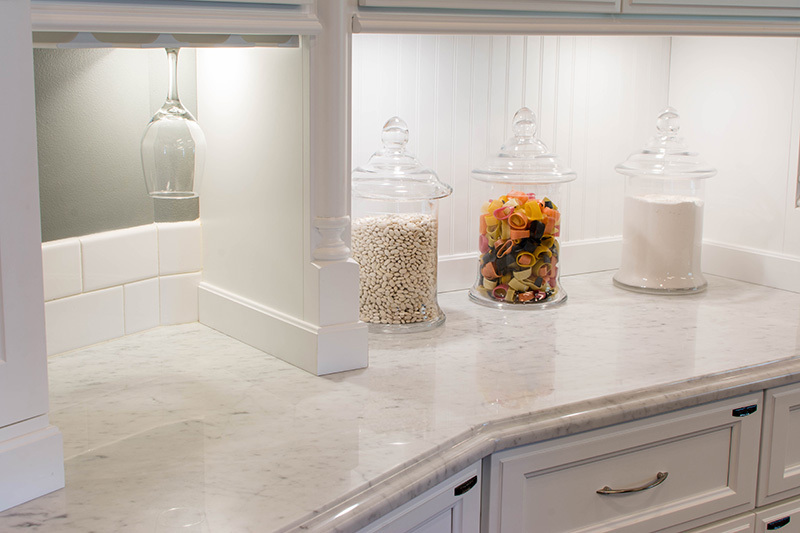 Quartz countertops are engineered and made mostly of quartz – a natural stone, pigments, and resins. Although quartz in most cases is easy to care for and does not require sealing, you still need to be careful with what cleaner you use and avoid harsh scrubbing. Quartz is also a popular choice in countertops because of the unique selection of colors and an endless number of patterns, not to mention we also have a huge sample selection from Cambria that makes designing with our clients a terrific experience. For a more broader range of looks, laminate may be a good choice. The choices are practically endless with all the graphic patterns and colors available, and it may also be a more cost-effective option while still getting a natural stone or wood look. Laminate is also a great option for areas such as a the garage, workroom, or laundry room. Marble - a classic natural material that can be used in a variety designs. In a Kitchen application, the main challenge lies in the care. Marble is a very soft, porous surface leaving it susceptible to stains and scratches. With light to moderate use, along with proper care & maintenance, it can serve as an elegant selection. 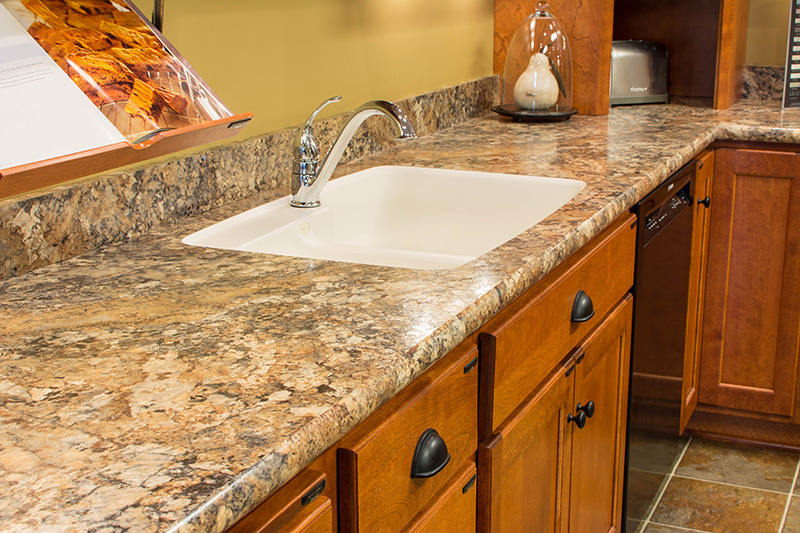 Now that we have briefly described various countertop options - What’s the best fit for your kitchen? That’s where the designers at Mullet Cabinet can help! Each material has its own unique look, feel and practical application. Let our experts walk you through determining the best fit for you space, family and style!